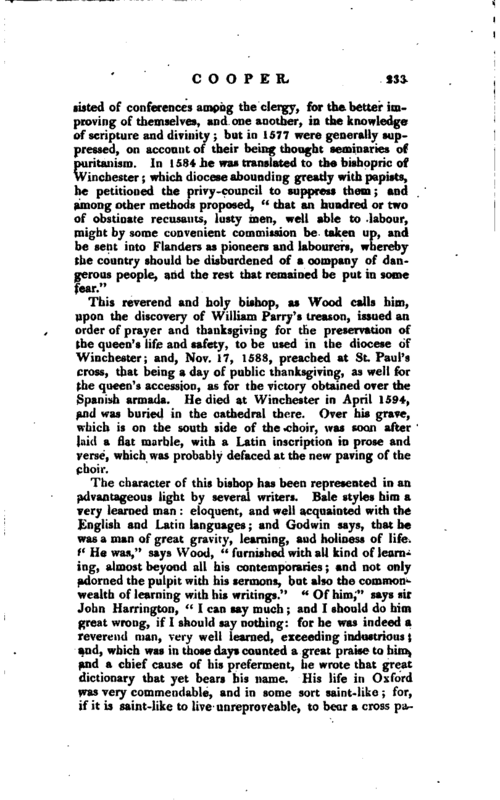 This reverend and holy bishop, as Wood calls him, upon the discovery of William Parry’s treason, issued an order of prayer and thanksgiving for the preservation of the queen’s life and safety, to be used in the diocese of Winchester; and, Nov. 17, 1588, preached at St. Paul’s cross, that being a day of public thanksgiving, as well for the queen’s accession, as for the victory obtained over the Spanish armada. He died at Winchester in April 1594, and was buried in the cathedral there. Over his grave, which is on the south side of the choir, was soon after laid a flat marble, with a Latin inscription in prose and verse, which was probably defaced at the new paving of the choir. 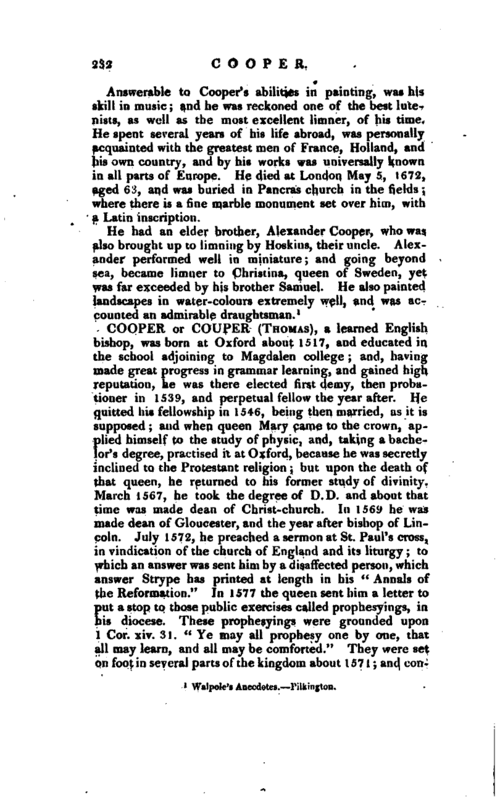 The only charge brought against him was that of covetousness, while bishop of Winchester; but this he fully refuted, by proving that, though his bishopric produced 2,700l. his clear profits amounted only to 398l. —Strype’s Annals, Appendix, vol. III. p. 58. He married a wife at Oxford, by whom he had two daughters: but he was not happy with her, she proving unfaithful to his bed. “The whole university,” sir John Harrington tells us, “in reverence to the man, and indignity of the matter, offered to separate her from him by public authority, and so to set him free, being the innocent party: but he would by no means agree thereto, alleging he knew his own infirmity, that he might not live unmarried; and to divorce and marry again, he would not charge his conduct with so great a scandal.” The character of this woman makes us doubt the story that she burnt the notes which her husband had, for eight years, been collecting for his dictionary, lest he should kill himself with study. 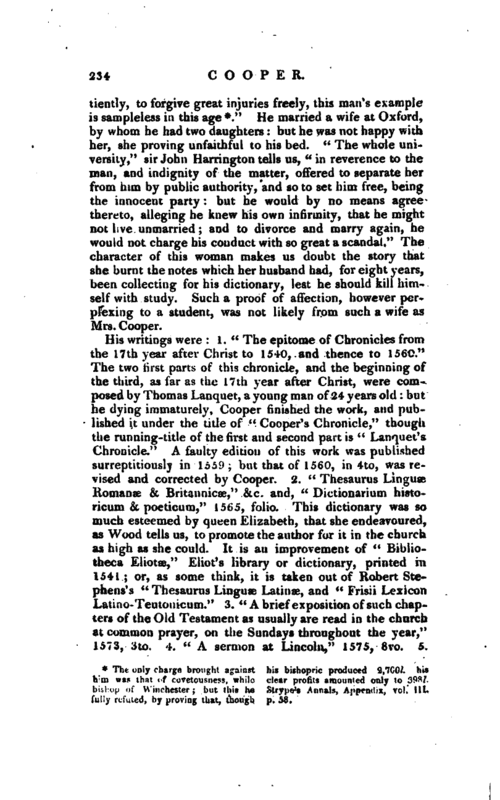 Such a proof of affection, however perplexing to a student, was not likely from such a wife as Mrs. Cooper. Biog. Brit Godwin. —Ath. Ox. vol. I. —Strype’s Parker, p. 316, 346,  465. —Strype’s Whitgift, p. 132, 187, 288, 299. 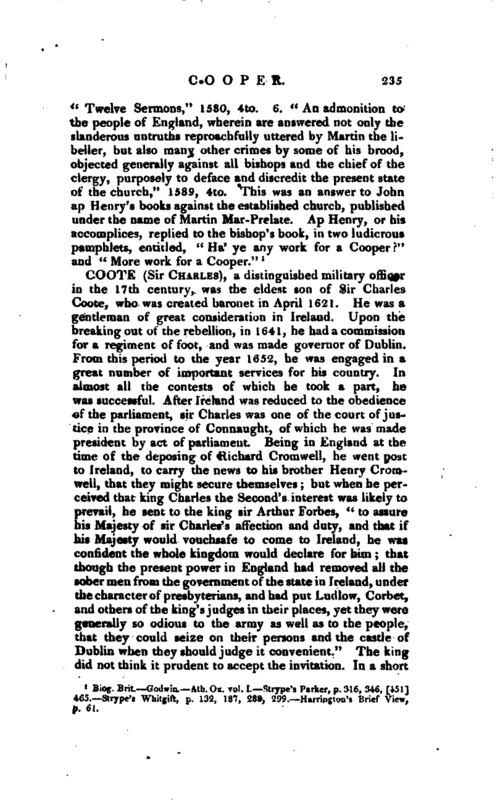 Harriogton’s Brief View, p. 61.